As I understand it ‘Hungry Ghosts’ are a product of Karma, and a punishment dealt through the process of reincarnation for a life lived selfishly and to excess. The crime for becoming a hungry ghost following your death could best be explained as being a combination of the Catholic cardinal sins (Seven Deadly Sins) of ‘Greed’, ‘Lust’ and ‘Gluttony’. In physical appearance hungry ghosts are depicted as having huge bloated stomachs, and tiny necks or mouths through which it is impossible to ever pass enough food to sate its appetite and quench its hunger. "Mouths the size of a needle's eye and a stomach the size of a mountain"
Some believe that following death and subsequent transformation those who are turned into hungry ghosts lurk in the shadows of our world, continuing their futile efforts to achieve satisfaction, by feeding on the emotions and actions of the living. The Sanskrit word for a hungry ghost is ‘Petra’ which means ‘departed one’ and as mentioned above transformation following death into a hungry ghost is associated with the crimes of greed, lust and gluttony. ‘Gluttony’ is described as the cardinal sin of over-indulgence, or over consumption of anything to the point of waste and is usually associated with an excessive desire for food. ‘Greed’ is similar to gluttony but is usually associated more with the pursuit of wealth, status or power, and in particular to the gaining of material wealth through the practises of violence, trickery or manipulation. ‘Lust’ like greed and gluttony is another sin of excess, and is associated with the unrestrained desire for sexual pleasures. 'The hungry ghosts are the most common of our indigenous ghouls, and I’m not entirely surprised to find him in a go-go club, for they feed on every kind of vice. They bring bad luck and the only repellent is a visit to the temple and an expensive exorcism by the monks. Every bar in Thailand has its tales of girls who were contracted to spend a night with a Falang, only to flee into the night because the Falang had chosen an old run-down hotel infested with these filthy spirits, waking to find an apparition greedily lapping at the used condom the Falang had been to lazy to dispose of'. – Bangkok 8, John Burdett. Hungry ghosts occupy the 3rd realm of the Bhava Chakra, otherwise known as the ‘Preta-Gati’. The Bhava Chakra (or ‘Wheel of Life’) is divided into six realms encompassing the different cycles of death and rebirth. 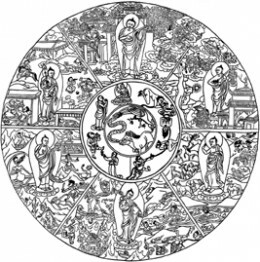 As with all things Buddhist the state of being a hungry ghost is temporary, and whilst I have described it above as a punishment, it may also be perceived as being a beneficial learning experience through which the soul is encouraged to learn from previous mistakes, in order to avoid them in future lives, and achieve enlightenment. The Buddha within the realm of the hungry ghosts distributes the gifts of the Gods from within a bowl, seeking to entice the hungry ghosts into desiring ‘truth’ over physical pleasures, for it is said that only through this desire for the truth can the appetites of the hungry ghosts ever truly be satisfied. Hungry Ghost Captured in a Malaysian Cemetery? Wow, its amazing the things people see and believe in other countries. Its interesting, to me anyway, that if you think about it, nearly every pain, or "punishment" can be used as a tool for learning, and bettering your life. Now or in the next. I am all too familiar with "Hungry Ghosts." As a kid, I was told by my dad to not ever take food or anything else from the temple without the monks permission, otherwise the penalty would be an eternity spent as a Hungry Ghost. Yikes! You better believe I stayed away from their fridge! You did an excellent job on this post, my friend. I kind of wish I did it :D You articulated the complexities of the Bhava Chakra nicely. Kudos to you!